Taxis in Ghana often have slogans or Bible verses in their rear windows. I was intrigued by this one I saw on my evening walk. The driver was cleaning his taxi, so I stopped to talk to him. 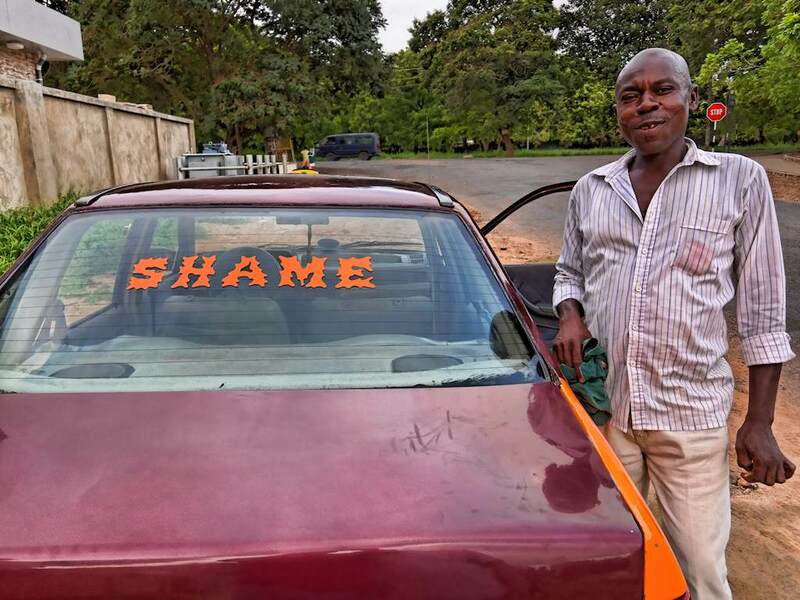 When asked why he put “shame” in his rear window, he said that a client stole something valuable out of his taxi. “The shame is for that person”, he said. I guess so. Here is a little selection of what I have seen in the rear windows of taxis. This entry was posted in Ghana, Signs and tagged Shame. Bookmark the permalink. These are really awesome! In many ways it seems like Ghana has a very different culture than what we experienced in Cote d’Ivoire. I’m enjoying these glimpses of it. One of these days I want to get back there to show my husband where I grew up…once things calm down enough. We have lived in Cote d’Ivoire and so I can say that there are significant differences between Ghana and its neighbor. However, there are also lots of similarities.